Today I visited our Chunuk Bair diorama at The Great War Exhibition for the first time since I had last seen it a week before it opened to the public. Having been involved with the diorama from the beginning of the project, I knew what to expect - or at least I thought I did. But this was the first time I had seen it complete and with all the other exhibits in situ around it. 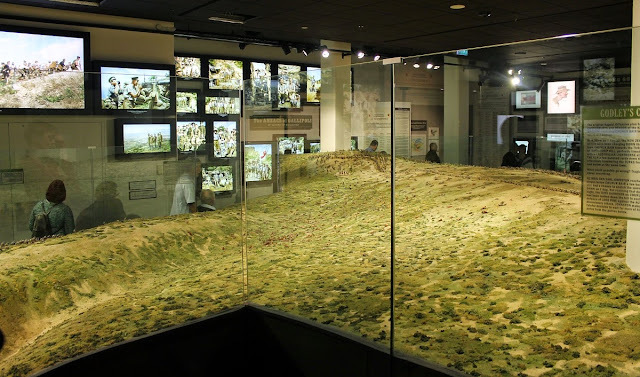 And it was the first time I had experienced the reaction of the general public to both the overall effect and the emotional impact of the diorama. I was as flabbergasted as if it was my first time. Hopefully the following few photos give you an impression of what the setting of the diorama is like. These pictures follow on from my earlier series of photos showing details of the diorama itself, taken a week before opening day. Don't forget to click on any photos you want to see larger sized. 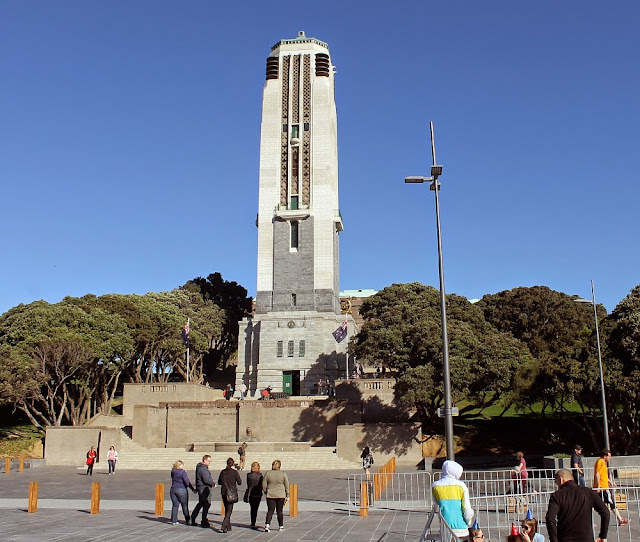 It was a beautiful morning in the Pukeahu National War Memorial Park today, with lots of people already starting to gather to see Prince Harry who was to make a flying visit in the afternoon. I made my way up the steps beside the Carillion to the old Dominion Museum, now housing The Great War Exhibition - you can just see its large badge peeping out behind the Carillion tower. I've posted elsewhere photos of the main part of The Great War Exhibition. 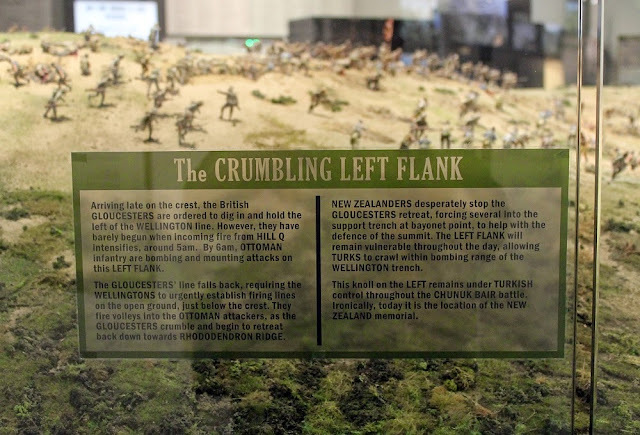 In this posting I'll just concentrate on the ANZ New Zealand Room, which this year commemorates the Gallipoli campaign. 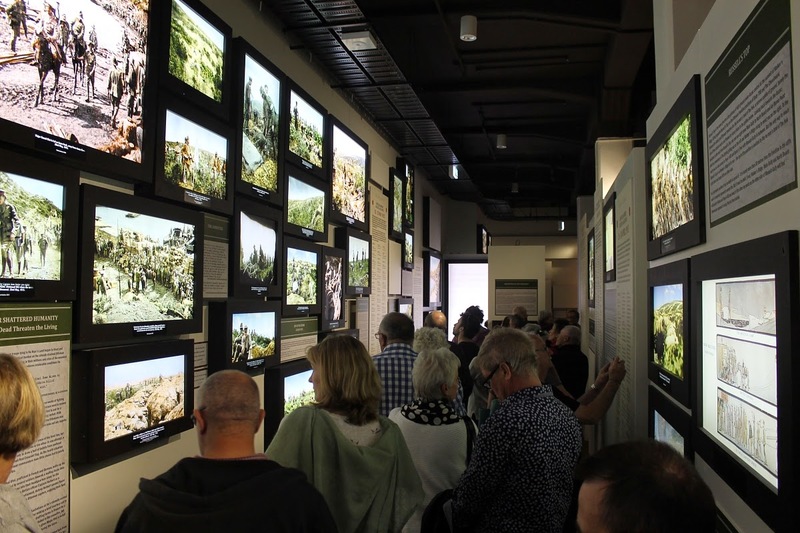 Besides the diorama, one of the main features of this room are the 200+ colourised photographs that line the walls as you walk down the winding entry passage into the diorama room. 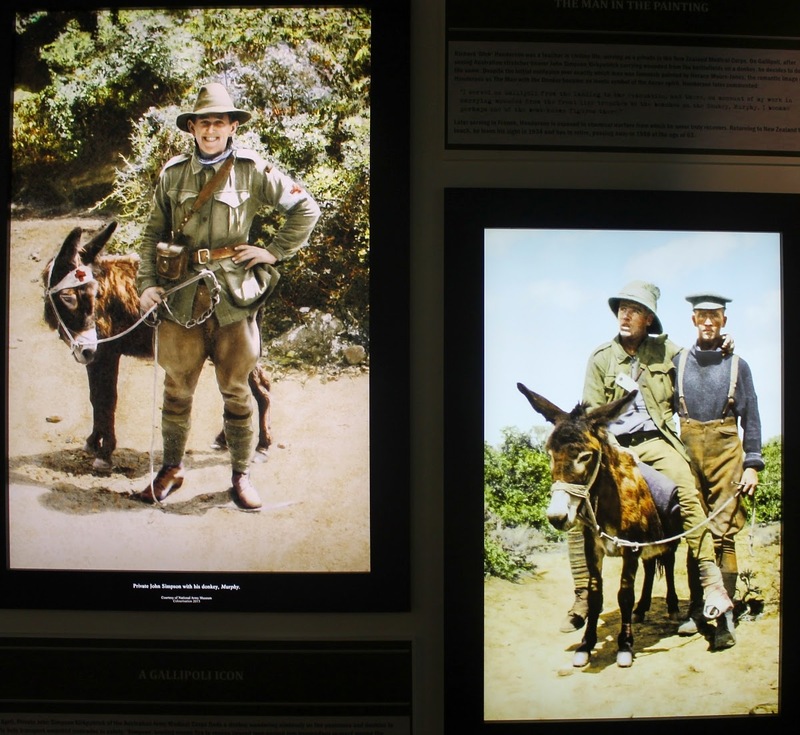 The colourised photos really bring to life pictures that we've always previously seen as black-and-white, for example these two famous pictures of men with donkeys, one an Australian, the other a New Zealander. 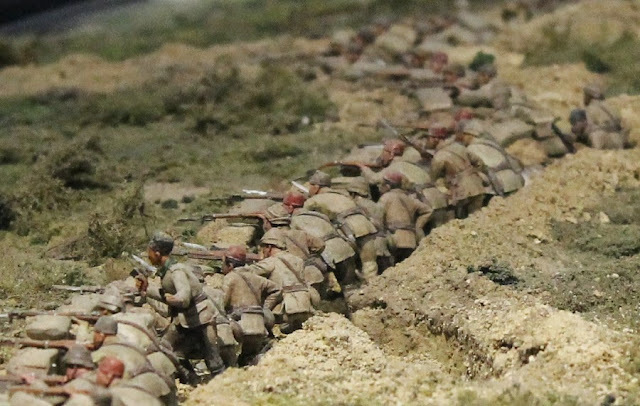 After winding down the entry passage with its colourised photographs, this is the first sight you get of the diorama. 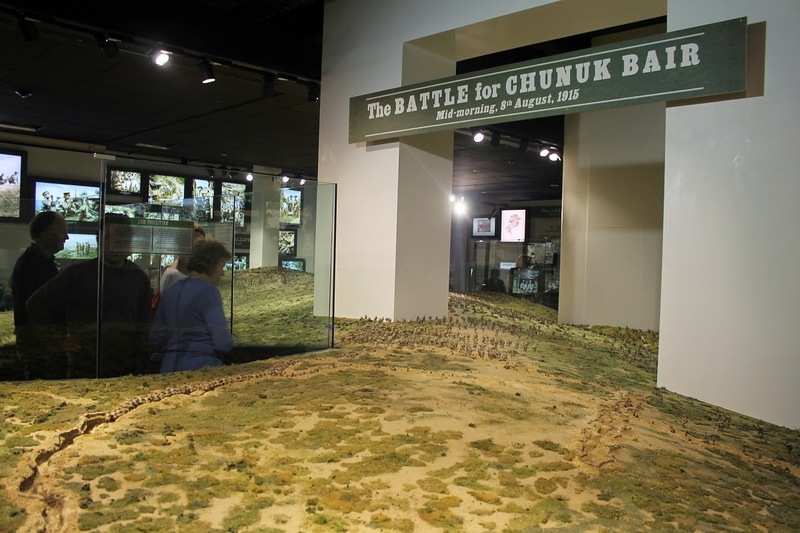 This is Battleship Hill, with the ridge-line of Chunuk Bair itself hidden behind the pillar. The diorama has had to fit around a couple of these structural pillars in the Museum, but they don't detract too much at all. Here's the outlook from the first of the two viewing platforms. 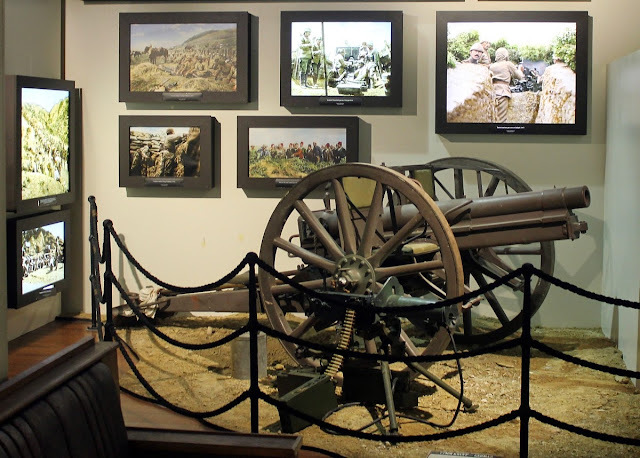 It looks out over the top of Rhododendron Ridge (left) and the trenches of Chunuk Bair (right). Stepping back from the viewing platform, you reach the Apex end of Rhododendron Ridge. Note the glass fences that surround and protect the diorama. Walking further round, you look back across Rhododendron Ridge to Battleship Hill. As you can see, there were large numbers of visitors when I was there, and they were all obviously engaged with the diorama and the story it tells. 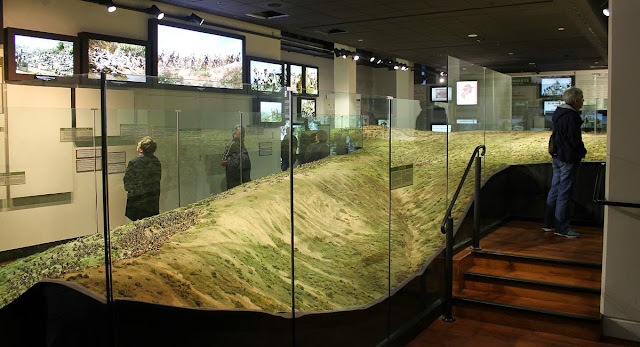 The is the Hill Q end of the Chunuk Bair trenches (though Hill Q itself isn't included in the diorama). 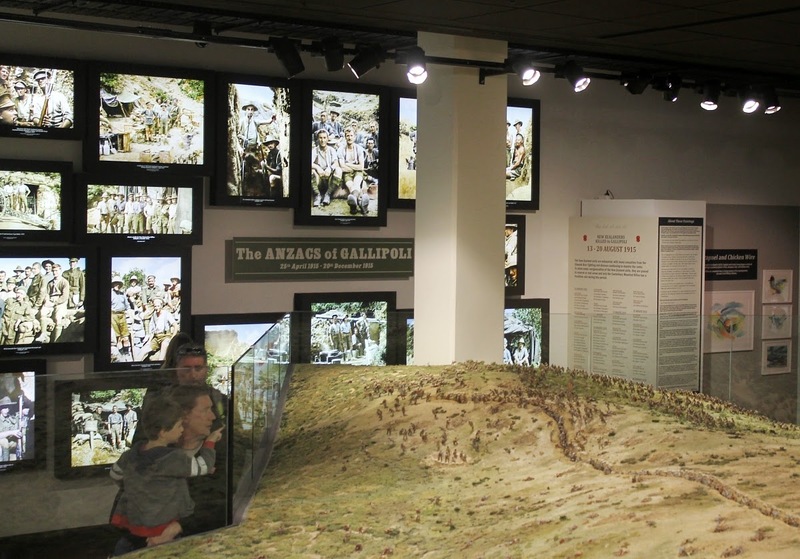 As you can see, the colourised pictures continue on the walls right around the diorama. 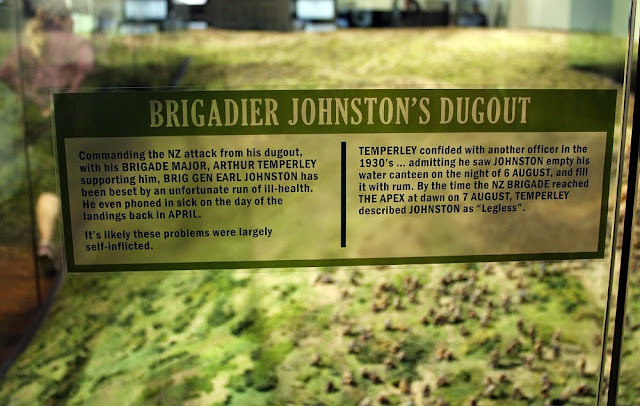 The diorama interpretation was cleverly done with semi-transparent placards affixed to the glass screens telling the story chronologically as you move around. This one is near The Apex. The story told by the placards is well researched. 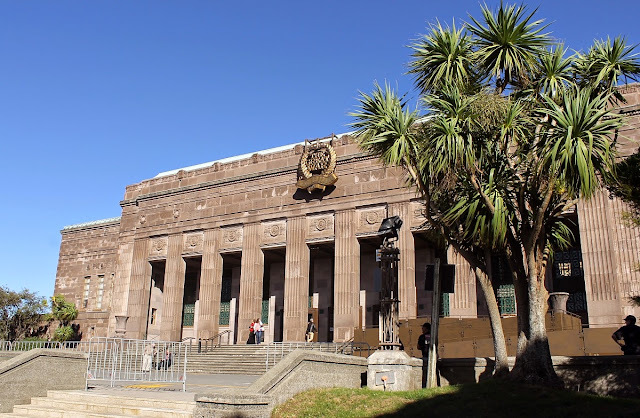 I learned a lot of information that I had never known about before, such as the story about hitting rocks at three feet. The last paragraph of this placard was something else I hadn't thought about before. 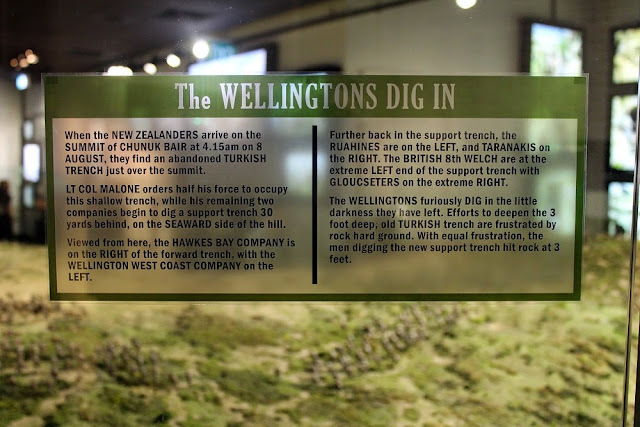 We see some visitors following the story of the waves of Turkish surging up Chunuk Bair to oust the New Zealanders and British. There is a lot of blood in the diorama. Whilst it may be tempting to think this effect is overdone, accounts from the time say the ground actually turned reddish-brown from all the blood. This diorama doesn't hold back any punches in telling it the way it was. The last time I had seen The Apex a week before the opening of the diorama, there were probably only a third of the figures who now populate the scene. These depict the reinforcements waiting to head over the crest and up Rhododendron Ridge to attempt to assist the Wellingtons. 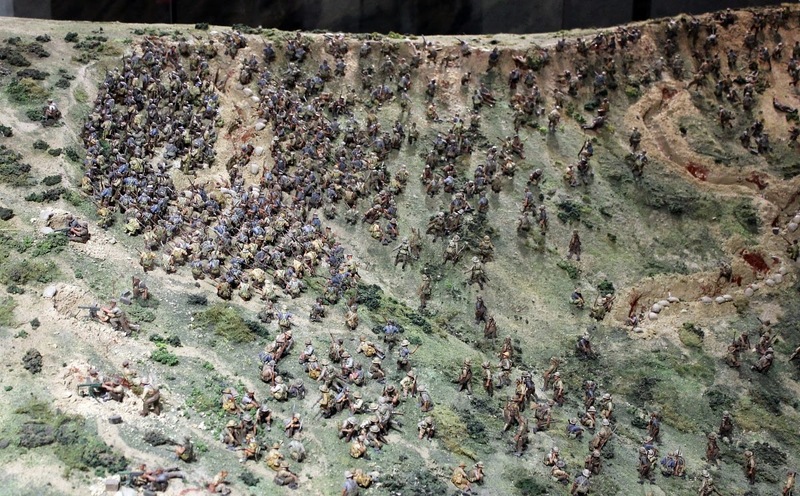 Despite there being 5000 figures in the diorama, each one has been painted lovingly, as you can see with these Turks in their trench on Battleship Hill. I particularly like the officer, encouraging his men, but I'm not sure how long he'll survive if he keeps his head up like that. 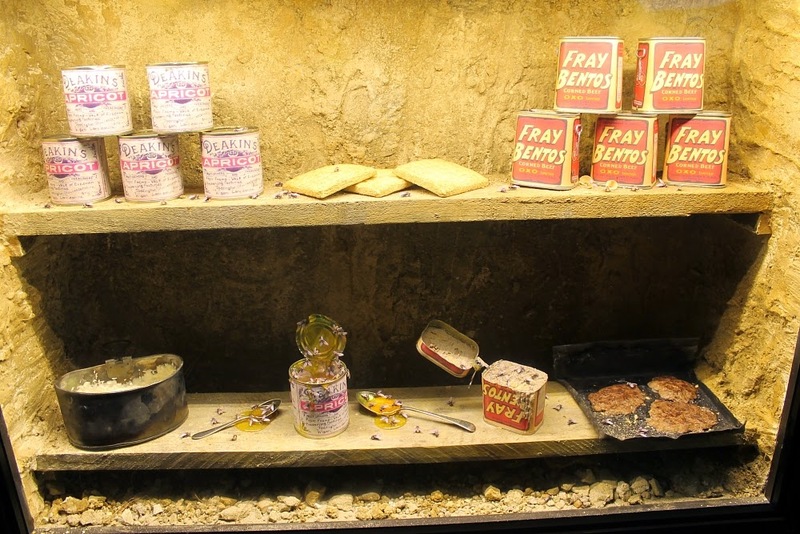 The New Zealand Room also includes some boxed displays, such as this selection of food, swarming with flies. There are also pieces of weaponry dotted about, some from Sir Peter Jackson's personal collection. Again, look at those colourised pictures in the background, this time bringing the Turks to life. 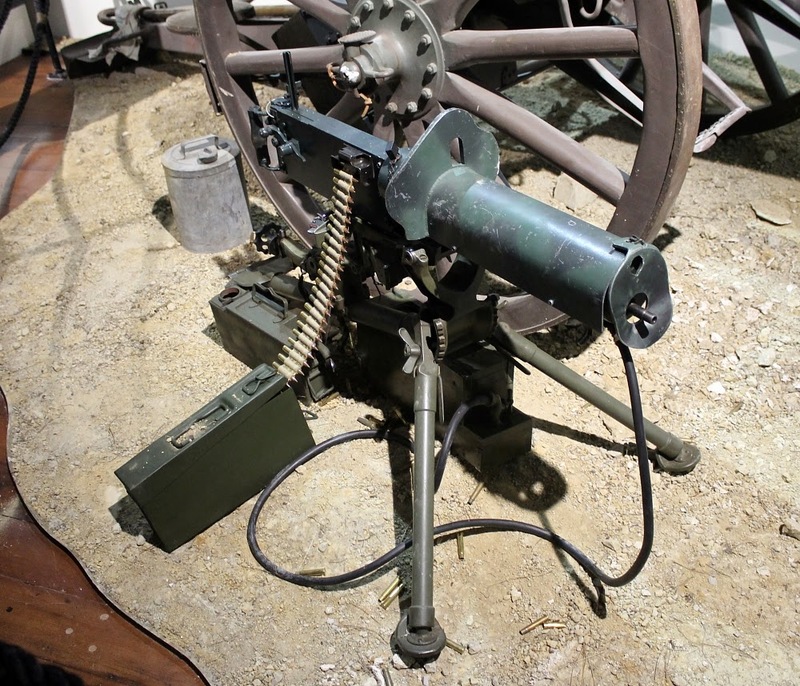 When we were painting the miniatures, one of the questions was what colour to paint the machine guns. Luckily there was a real one to give the correct information. Whilst I was examining the diorama this morning, I ran into one of the Wellington painting team, Paul Reynolds, and his daughter. He has placed some exquisite photos of his visit onto the Pendraken Forum. So, that's the diorama. But bear in mind that these photos just don't do it justice - you've got to try and see this for yourself to experience its real impact. 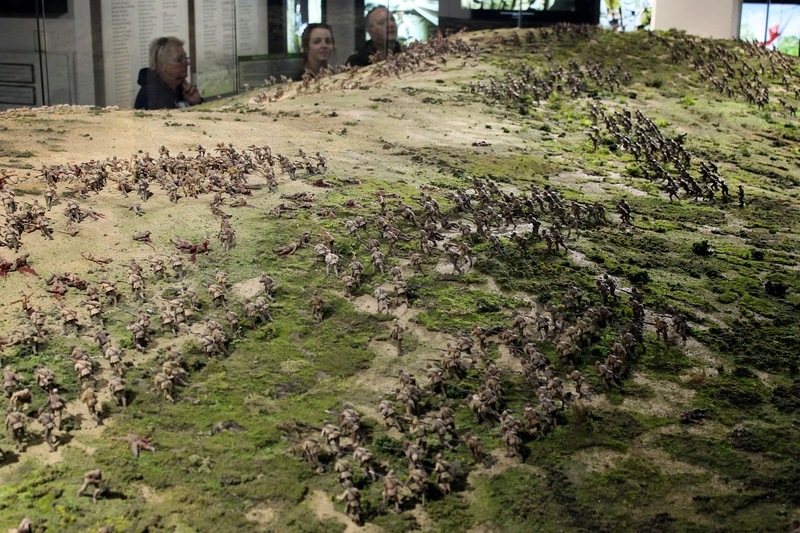 Fantastic diorama - thanks for the great pictures and report for those of us too far away to visit. I can't wait. Just looking at the room - so different from the building site I last saw.I never knew there was floor there - it seemed covered in bits of flock, plaster, buckets of paint and modelling materials, polystyrene and trays of models.